Every now and again I like to share things that I teach my students – things that challenge them a lot and make them grow. Usually it’s a technical thing that is weird at first but needs to get ‘un-weird’ for the hands. 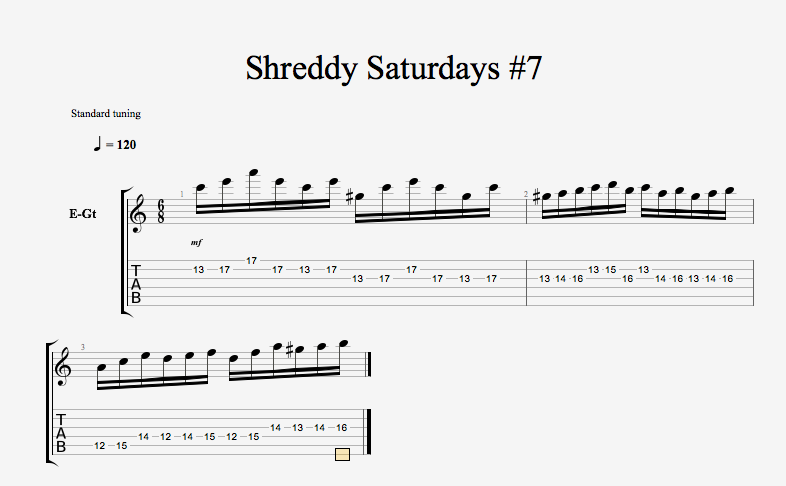 These small licks are motivational and key to keeping ones playing fresh and exciting. Enjoy the video, and the tab is below! Hey folks! This is a playthrough of my song ‘Entropy’ coming from my new E.P ‘TARTARVS’! Due for a July 15th release, this is my most ambitious musical project to date. Each song has awesome solos, harrowing vocals, and is not for the feint of heart! Iron Age Accessories makes a whole lot of guitar gear, and when they sent me some of their picks I of course was intrigued: I had tried picks made of bone and horn before, and was not entirely swayed by them as they felt ‘odd’ and perhaps not ‘guitarristic’. A company that also makes kill-switches and guitar knobs also making guitar picks? I wasn’t very sure of how it was all going to work, but I did not make any assumptions. Instead, I kept my mind open. I like reviewing things with a blank slate and consumer point of view, as opposed to a ‘reviewer’ point of view. Mostly because I want to know if I was buying these picks, if I’d like ’em or if they were going to end up in my enormous pick collection. Ultimately the picks that end up in that big blue box are not bad at all; they just do not get used regularly. I actually have very few picks that I do not like – they usually get given away if a friend or colleague enjoys them more than I do. Everyone wins. Let it be also noted that these folks make gem, stone, metal and carbon fiber picks which in the first place has me very curious about how experimental this company is: they bloody must be! Another way any company attracts my gaze is that exact spirit of experimentation – it makes me more excited to try their products! The bone material pick is really odd – there is a certain glassiness and familiarity with my old Tortex favourites in this one. And it’s comfy. I know, “WTF Pol, u hate Jazz 3s!” And though that may be true, these are seemingly the only Jazz 3 style shapes I get along with. I figure its because the surface area of my thumb is adequately satiated – as I have big flat thumbs that hate tiny picks. They seem to get lost in my hand. These picks don’t. over to the old favourites. What did I notice? Against some of my very favourites, these Iron Age picks are obviously incredibly stable: they aren’t thin picks by any means! The fact that they are not thin does not bother me too much; in fact it’s even kind of welcome. The tips on these picks, the way they are angled, are very conducive to alternate picking and even economy picking. Aggressive angles make it easier to get that big attack out of your note, and if you flatten the pick to a more parallel positioning against the strings, the attack dulls and the chirp goes down significantly. For that reason, I really enjoy! The difference between the bone and the horn is more feel than it is a material or tone, at least to me. I play with a LOT of gain when it comes to lead channel work, and with a moderate amount of gain to even a low gain sound when it comes to rhythms. The feeling I get when playing with the horn pick is really truly reminiscent of the Tortex 2.0mm that I used to play to death – the difference being these picks have that aggressive styling and are grippy! Oh goodness the GRIPPINESS! I haven’t dropped these picks once – and that’s a great sign because they haven’t been able to rest since they arrived. All in all, these are definitely worth it to try. I find them to be the only Jazz 3’s I am comfortable with. I am impressed, and wouldn’t mind tickling a few more picks in their product line. Carbon Fiber? Yes please!